Transportation of bulk liquids across the globe had once been relegated to only being able to use large tanks that caused spacing concerns and potential worries about contamination. That’s because improper washing techniques or the aging process made such tanks vulnerable to those issues. Such concerns diminished considerably when flexitanks became available more than two decades ago. The main beneficiaries were those in the business of bulk liquid transport. As the name implies, flexibility is one of the many assets that make this a choice that continues to grow in popularity. Another is the fact that the bag has been specifically designed for liquids. One of the best reasons to use flexitanks is the fact that once the product has been delivered, the bag can simply be recycled. That’s because the bag is made primarily of polyethylene, which makes it an environmentally-sound consideration that offer a company solid value. Another benefit with this option is the opportunity to use other travel options when considering how to send the product in question. Traveling across oceans and other bodies of water means that the flexitanks will be placed inside a 20-foot container for convenience purposes. The problem for bulk liquid transport companies that need to make those shipments is that it’s the only option they have, since airplanes will not allow the containers onboard. However, they’ll welcome the convenience that comes with flexitanks that can be neatly placed aboard and then picked up as if they were never there in the first place. 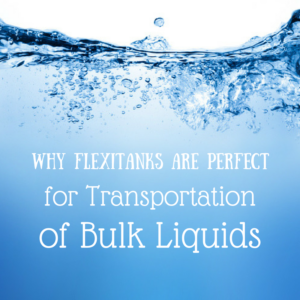 Of course, the convenience when it comes to loading and unloading flexitanks provides additional evidence concerning the benefits of their use. Instead of trying to maneuver a massive tank with a forklift into a shipping area, simply putting on one flexitank after another has been estimated to reduce the time to both load and unload by 90 percent. Not only that but more than 30 percent more liquid can be added to a single load, which means more revenue and a containment on shipping costs. On the back end, there’s no container to worry about, which would ordinarily result in additional freight charges. In addition, there’s no container to wash out, which eats up precious time and obviously costs more money. That savings that come with having a flexitanks provider can help enhance a company’s bottom line. That means that businesses with tighter profit margins don’t have to worry about whether or not transportation of bulk liquids is something that will eat away at those margins. Depending on what’s being transported, customers have the option of using flexitanks that have thermal insulation. This can be vitally important for items that are temperature-sensitive or for shipments that may be traveling through dicey weather conditions. Kan-Haul is a flexitanks provider that’s been in business for three decades and has established a stellar reputation when it comes to bulk liquid transport. They know how to do the job efficiently and correctly and can make sure that any transportation of bulk liquids meets a customer’s specifications. Contact us to be your flexitanks provider.